I had an account in Windows hotmail. When I tried to close this account I received a message “Cannot close. Email address is removed for privacy”. What should I do to close this account permanently? 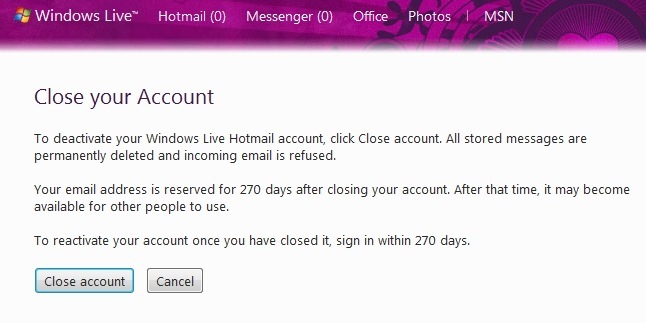 >>Log into your Hotmail account. >>Click the down-arrow to the right of your name at the upper right of the Hotmail window. >>Now click that down arrow again and choose Account again. You should be on an "Account overview" page. There will be a "Close account" link toward the bottom. 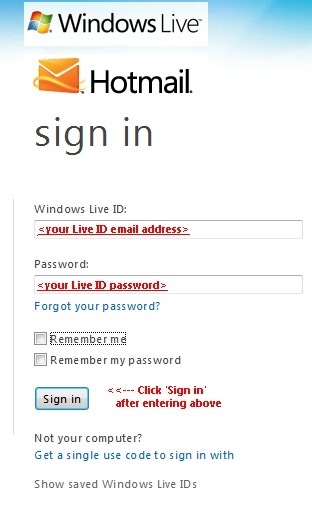 >>You can also log into the MSN account and disassociate the Hotmail account from the MSN profile. Step 2. Enter your mail ID and password. Step 3. Click on "Close account" button. Step 4 Your account will be reserved for 270 days so that if you want to re-activate it, you can do within 270 days. After 270 days it'll be deleted permanently and you'll not be able to re-activate it.